Just a small example of the sort of waste known as “waste electronic and electrical goods” or “WEE waste”. With the way technology is becoming obsolete and being replaced by better models year after year with newer, better, bigger and improved specifications , you can just imagine the huge amount of waste that is generated when consumers upgrade along with the process. For example, one household may have one or two computers to upgrade on a yearly basis but if you add to that computers and monitors from even a small business, the numbers add up very quickly. Just a small example of the sort of waste known as “waste electronic and electrical goods” or “WEE waste” and it is at the core of correctly recycling electrical and electronic goods throughout the EU nations. 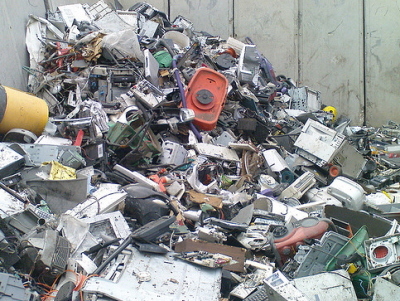 If you live in a country which complies with the EU WEEE Directory, then all you need to do is ensure that you don’t throw this type of goods inot the residual waste bin, but follow local authority and supplier guidance. In essence, within the EU this recycling will be done for you and that’s usually done for free as well! Outside the EU its not so easy, and you should follow the rest of this article. What is the problem with throwing computers, their monitors, TVs and the like away with the rest of our trash? The main concern is that with CRTs and TVs they each contain approximately four pounds of lead per unit. Lead cannot be biologically broken down and if it were placed in a landfill there is the possibility of the landfill becoming contaminated with the toxins from lead. Lead poisoning has been associated with several health problems in children, including, learning disabilities and behavior issues and in some extreme cases, where high doses of the lead has been found, there have been reports of seizures, coma and even death. There is always the risk of lead toxins seeping into a water source if left in a landfill and any results of lead poisoning are made even more tragic because they are so easily preventable. In addition to the lead in some household items like computer screens and TVs, the plastic parts of these items sometimes contain a component that is called, brominated flame-retardant that helps the item to be resistant to flames in case of a fire. Unfortunately, while the exact results of exposure to this additive are undocumented there is sure to be some kind of negative result that it’s just better to steer clear of. In an effort to keep these potentially hazardous materials out of landfills there are many other options for ridding your home of older, outdated technology. The first option should be to check with your community to see if there is a program set up to receive older CRTs and TVs for recycling. For instance, in Massachusetts, where I live, many cities and towns were given grant money for the specific purpose of setting up a recycling electrical and electronic goods program. If your town does not have such a program the next place to look would be at a local TV repair shop or even an electronics retailer because they may be able to reuse what you want to throw out. Some areas even have electronic recycling companies that will come to your residence or business and pick up such items and from there they are responsible for the recycling of the items. Even if a piece of electronic equipment can no longer be used for refurbishing an older model they can always be dissected and the individual components can be sold for their scrap value. No matter what the item is that you want to recycle, there is a way to do it, all you need to do is make a phone call or two and you will have done your part to follow the recycling laws. When considering recycling people automatically think about paper, cardboard, glass and plastic. We seldom provide a reservation to exactly what will certainly be taking place to our soft goods and general electrical home appliances once weve decided they require to go down the suggestion.The reality is Electrical equipment is the fastest growing classification of rubbish throughout the European Union. This seems to make good sense when you consider how much we rely on electronic and electrical products to delight in life and to work in our work environment in modern-day society. However its possibly a little frightening, that according to statistics around 20kg per individual of electrical waste is created every year. Each year, the UK now produces around 1 million tonnes of waste electrical equipment and there is a recycling electrical and electronic goods for most categories of WEEE. Exactly what lots of people do not understand is that along with other laws such as product packaging policies, in 2004 the EC passed a regulation on Waste Electrical and Electronic Equipment. In the UK this is understood as WEEE, WEEE compliance or WEEE policies. Now this is in place companies require to be aware of exactly what it requires to stay legal. Manufacturing: under WEEE compliance, makers and producers of electrical equipment will be anticipated to consider eco-friendly requirements at design phase. At the basic stage of production both makers and importers will certainly be responsible for ensuring they plan for their items to be recycled rather than discarded. Where possible this will certainly likewise consist of further production of existing products. WEEE recycling policies will require electrical devices producers to finance treatment and recycling/recovery of separately collected WEEE in the UK, to specified treatment standards and recycling/recovery targets. The new regulation will certainly mean that all shops and merchants will certainly be required by law to provide take-back services to householders. Gone are the days when you needed to ask your self yes, however will they take my old cooker away? What products are covered in the WEEE compliance policies? The government’s objective has been to produce a nationwide distributor Take-back Scheme which will establish a network of Designated Collection Facilities; and an obligatory registration for producers through approved compliance schemes.